Background: When not in use, instruments are sometimes placed on top of the patient’s body during laparoscopic procedures. Such instrument “hoarding” has been previously mentioned as a non-optimal practice. Ergonomic design of surgical workplaces may improve efficiency while maintaining safety. However, no studies have been carried out to describe where instruments are placed during surgery. We tested the hypothesis that the patient’s body was frequently used to park instruments when not in use. Methods: Nissen fundoplication procedures were video recorded with both intra- and extra-corporeal cameras. Locations of idle instruments were coded as being at the top and bottom (superior and inferior regions) of the sterile field over the patient’s body. Parking and picking up of instruments by the surgeons were coded as direct or assisted by a surgical technician. Case time began at first camera insertion and ended with last camera removal. Results: Five cases were recorded (average case time: 101 min, range: 64-138 min). All 11 instruments were placed on the patient at some time during the operations. The ultrasonic dissector was placed on the patient most frequently (5-27 times per case, totaling an average of 71% of case time), followed by the suction-irrigator (6-46 times per case, averaging 57% of case time). Corded instruments were parked together with another instrument at the bottom and top fields 2-11 and 3-14 times per case, respectively. Two or more instruments were parked with a corded instrument at the top and bottom fields 10 and 5 times, respectively for the five cases. The surgeons parked or picked up the corded instruments 11 times per case, all directly from the top and bottom fields. In comparison, the surgeons parked or picked up un-corded instruments 33 times per case, 46% assisted, 35% from the bottom field and 19% from the top field. 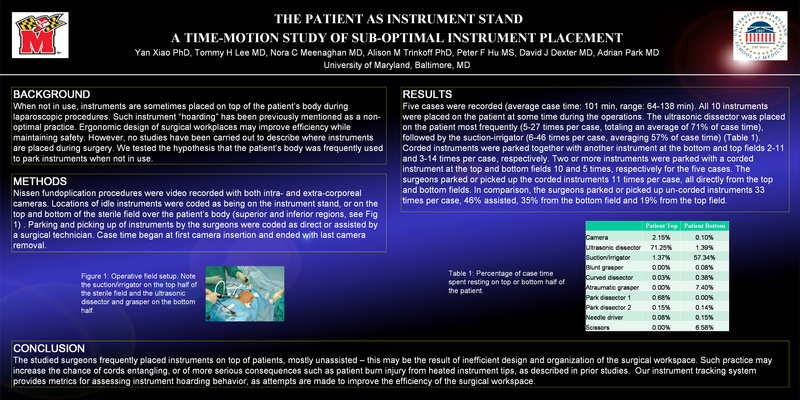 Conclusion: The studied surgeons frequently placed instruments on top of patients, mostly unassisted – this may be the result of inefficient design of the surgical workspace. Such practice may increase the chance of cords entangling, or of more serious consequences such as patient burn injury from heated instrument tips, as described in prior studies.